Thyroid TSH levels are the subject of a big controversy. A TSH test is the standard blood test that is recommended in most countries by regulatory medical boards to screen for thyroid disease, make diagnosis and to monitor thyroid replacement therapy. While the medical community and doctors rely on this test in treating thyroid disorders the effectiveness of this approach is highly questionable because many patients continue to not feel well. Today I am going over the common thyroid imbalances that cannot be diagnosed and treated by using the TSH test alone. Go through the list and see what applies to you because it could be the answer to why you still have persistent hypothyroid symptoms that just don’t go away. Thyroid-stimulating hormone or TSH is produced by the pituitary gland and it stimulates the thyroid gland to produce thyroxine (T4) and triiodothyronine (T3). The hypothalamus is a gland that releases TRH (thyrotropin-releasing-hormone) to trigger the secretion of TSH. TSH is a commonly used marker in conventional medicine to diagnose hypothyroidism and hyperthyroidism. In fact, according to the American Thyroid Association’s “Guidelines for the Treatment of Hypothyroidism” (2014), TSH is the only test recommended to use for thyroid disease screening. The American Thyroid Association (ATA) recommends beginning TSH screening in all adults at age 35, with repeat tests every 5 years. The American Academy of Clinical Endocrinology (AACE) recommends routine TSH screening in older patients, with no specified age. The US Preventive Services Task Force (USPSTF) continues to recommend against routine screening for thyroid disease among non-pregnant women and asymptomatic adults and recommends targeted TSH screening only for patients with certain risk factors instead. Absence of clear recommendations when and who to screen for thyroid disease created a situation in our society when thyroid disease often remains undiagnosed, misdiagnosed and mistreated. As a result millions of people are affected and don’t even know that they have a thyroid disease. Most doctors run the TSH test alone not only for thyroid screening but also to monitor hypothyroidism treatment, effectiveness of hormone replacement therapy and to adjust your medication dosage. 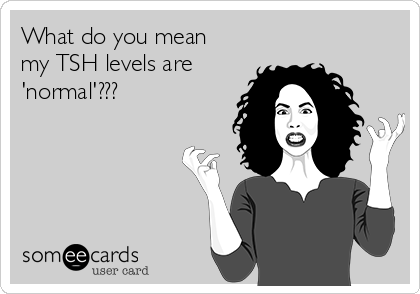 The problem is that being told that “Your TSH test is normal” doesn’t really have any meaning until you know your exact thyroid TSH levels and ensure that your doctor follows the new TSH normal reference range. In 2003 The American Association of Clinical Endocrinologists (AACE) reviewed and recommended new TSH normal rages as between 0.3 and 3.0. This means that you are considered hyperthyroid when your TSH is lower than 0.3 and you are hypothyroid when your TSH is higher than 3.0. Despite these changes many doctors and most laboratories in the United States still use the outdated 0.5 to 5.0 range as their normal reference range for the TSH test. When a lab sends test results to doctors they don’t mark TSH between 3.0 and 5.0 as abnormal and diagnosis of hypothyroidism can be missed. Furthermore, normal reference ranges are not the same as optimal. Ideally you want to have a TSH at the level of a healthy person or optimal. Studies show that a TSH in the lower end of the normal reference range between 1.0 and 1.5 is the normal level for people who don’t have a thyroid disease. If your TSH is in the normal reference range it doesn’t mean that it is optimal and you produce sufficient amount of thyroid hormones. 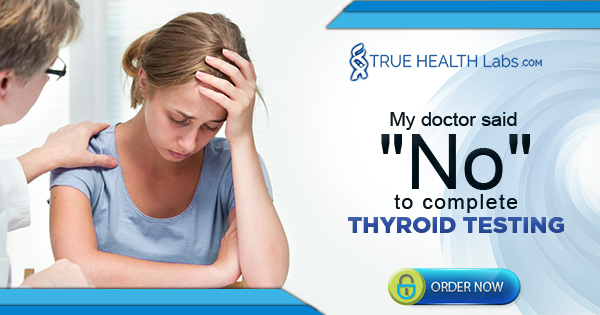 Your symptoms can still be due to hypothyroidism or Hashimoto’s disease if your thyroid TSH levels are not optimized. Most doctors still use TSH as the gold standard of thyroid screening and testing. However, the TSH test alone doesn’t give the whole picture and cannot be used to diagnose many types of thyroid disease. Let’s look into the cases when relying on the TSH test alone is not sufficient to make a diagnosis or even misleading. The progression from Hashimoto’s to hypothyroidism occurs gradually and it can take up to 10 years until hypothyroidism can be diagnosed using the TSH test. Many researches agree that euthyroid Hashimoto’s and high thyroid antibodies (TPO and Tg) precede the hypothyroidism diagnosis by 2-7 years and can be useful early indicators of predisposition to develop hypothyroidism later in life. However, new research shows that cytological studies can be a better more reliable early indicator of Hashimoto’s disease. Based on the ultrasound and FNA biopsy researches of the Thyroid Multidisciplinary Clinic at the University of Wisconsin came to the conclusion that about 50% of their newly diagnosed patients that came for the evaluation of their thyroid health issues, already had Hashimoto’s thyroiditis even without their thyroid antibodies elevated and TSH in the normal reference range. Another useful approach to early diagnosis and the possible slow down of autoimmune thyroid disease is the evaluation of the immune system. In fact, there are 3 autoimmune disease tests you can do to catch imbalances of your immune system early. It is important to look for early indicators of autoimmune thyroid diseases because it may help to slow down its progression and gives higher chances for the disease remission or a complete reversal without developing hypothyroidism and the need to manage it with thyroid medication. However, the TSH test is NOT suitable for these purposes and screening for thyroid disease using TSH test alone will inevitably result in missing Hashimoto’s diagnosis. It is a well-known fact that up to 90% of hypothyroidism in industrialized countries is due to autoimmune Hashimoto’s thyroiditis. Major cause of hypothyroidism in the third world countries is iodine deficiency, however Hashimoto’s is starting to become more common. The problem is that the TSH test cannot be used for early diagnosis and prevention of hypothyroidism caused by either Hashimoto’s as I mentioned above or iodine deficiency. In a matter of fact, the TSH test alone cannot point to the cause of your thyroid dysfunction at all. TSH test results can just tell you if you are hyper- or hypothyroid according to the medical guidelines but it doesn’t indicate what environmental factors or trigger events are involved and should be considered when choosing a treatment. The truth is that a proper treatment of hypothyroidism is not possible without finding and addressing the cause of thyroid dysfunction. This has important implications when it comes to hypothyroidism diagnosis and treatment in pregnancy, however new research studies show that it may not be enough to achieve a healthy pregnancy and ensure a healthy baby. As a result, the TSH test alone is not enough to prevent pregnancy complications and ensure healthy fetus development. It is important to know that thyroid function tests cannot be used as indicators of thyroid cancer. People who have thyroid cancer and nodules often don’t have any symptoms and their TSH is in a normal reference range. As a result having normal thyroid TSH levels doesn’t guarantee that you don’t have a thyroid disease. – Abnormal function of hypothalamus or pituitary gland including TSH-producing pituitary tumors. – Transition during treatment periods. For example, TSH readings are unreliable and changing during the early stage of hypothyroidism treatment with thyroid drugs because it takes between 6 and 12 weeks for the pituitary to re-balance in response to thyroid medication and new thyroid hormone levels. – Temporary episodes of thyroiditis and postpartum thyroiditis when conflicting values of TSH and free T4 may also be encountered. – Certain drugs such as dopamine and glucocorticoids that influence pituitary TSH secretion or thyroid hormone binding to plasma proteins, may also cause contradictory TSH values. As you can see, there are many external factors and clinical situations when the TSH test alone doesn’t reflect the whole picture on what is happening to your thyroid and additional thyroid testing is needed. Thyroid problems are so much more than thyroid TSH levels. This is the reason why so many people remain undiagnosed, untreated and undertreated for years, how your thyroid treatment can fail and why you are still suffering from hypothyroid symptoms regardless of your “normal” thyroid TSH levels. The longer you continue to just manage your hypothyroid and Hashimoto’s symptoms, the worse they become and the longer it will take to get better. The truth is that so many things that we are led to believe are “right” for our thyroid are actually some of the worst things we could have been doing and can only cause more damage. Learn about research-based treatment and experience the major transformation that occurs during this program to your thyroid health. 1 Hashimoto thyroiditis is more frequent than expected when diagnosed by cytology which uncovers a pre-clinical state. Thyroid Res. 2010 Dec 20;3(1):11.